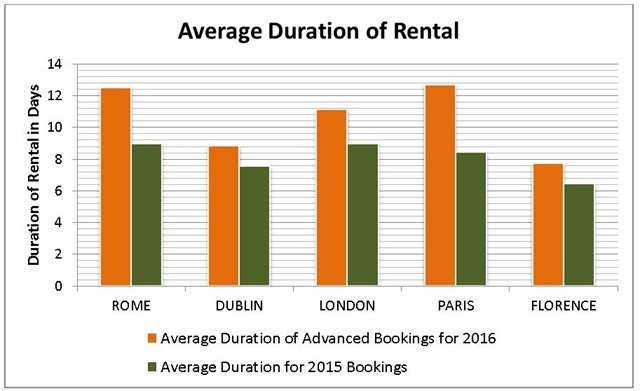 U.S. rental bookings for the top 5 European pickup cities for 2016 versus 2015. Charts courtesy of Auto Europe. Looking ahead to 2016, the top five pickup cities in Europe include Rome, Dublin, London, Paris and Florence. These findings reflect reservations made by U.S. residents prior to Dec. 1, 2015, according to data from Auto Europe. In terms of year-over-year growth, European car rental are up 15%, says Auto Europe. Paris fell from the top spot last year to the fourth spot, which may be attributed to the events in Paris in November. When looking at trip duration, travelers scheduled to pick up their vehicles in Paris and Rome in 2016 have extended their trip compared to 2015 — adding over four and three days to each trip, respectively. Average duration of advanced bookings by U.S. travelers for 2016 (orange) versus 2015 (green). Chart courtesy of Auto Europe. According to Auto Europe, the most popular vehicles reserved for 2016 include compact, mid-size and economy class. This is similar to the results from 2015. Click here for more information on Auto Europe’s 2016 car rental bookings report.